The content of each courses are developed along six interrelated domains of knowledge: architectural design, communication, architectural theories, technology, professionalism and character building. The level of competence to achieved in these domains of knowledge are: awareness, understanding, and ability. English 1 2 English course for Architecture is a university course (local curriculum) which is given in odd semester in Department of Architecture, Faculty of Engineering and Planning, Universitas Islam Indonesia with 2 credits. This course invites students to realize the role of English usage in Architecture. Students are presented the ideas in Architecture using English to make them easier in understanding what Architects do, to train them in using English in real work place, and to make them comprehend the vocabularies related to Architecture. 7 Human behaviour Understanding theories and methodologies that identify the relationship between physical environment and human behavior. 8 Sustainable City and Architecture Understanding the sustainability of city and architecture. 3. Paraline drawings, covering axonometric projection; 4. Perceptual drawings, covering perspective; 5. Principles of graphic composition, covering proportion, scale, balance. 1) Architectural Sketch Module; 2) APREB Module; 3) drawing drafting module; which are used as exercise for students to enrich and strengthen their basic skill of drawing. 3 Architecture, Science, Technology, and Fine Art Understanding of the relationship among architecture, science, technology, and fine art. Building Material and Construction 1 4 This course discuss basic knowledge about local building material which are commonly used, covering discussion about process, standard and characteristic of building material, also material application as the basis of construction in structure system and building envelop. This course has objective to equip students to have initial knowledge to be able to design simple building based of building material and construction choice. Building Material and Construction has strategic position in curriculum as basic knowledge in science and it is in accordance with vision and mission, it also becomes one of objectives of Department of Architecture UII which puts sustainable architecture with local wisdom. 25 Building Materials and Recycling Understanding of the manufacturing process and application of building materials based on basic knowledge on characteristics of materials, traditional way of usage, material standards; as well as recyclability, maleficience; and other control measure of building materials. 15 Integration of Building Systems in Design Understanding of building system and ist constituent elements such as building structure, building enevlope, composition of building mechanical and electrical service and other building components, and the ability to integrate them into his/her design. Courses’ Standard Competency: Students comprehend principles of envelop components construction and system of simple structure based on its building constituents. 2 Various means of expression Ability to express architectural ideas appropriately by means of various media such as sketch, model, drawing, writing and digital drawing. Courses’ Standard Competency: Students have ability to explain method of material arrangement as united building component through model, sketch, and drawing. 3) technical drawing compilation; 4) 3D model5) Oral Presentation which are used as exercise for students to enrich and strengthen their basic skill of architectural design drawing. 03 Architecture, Science, Technology, and Fine Art Understanding of the relationship among architecture, science, technology, and fine art. 09 Form and Spatial Organization Understanding of the basic principles of 2D and 3D forms and design, architectural composition and ability to apply these principles to design a building. Site understanding with logic and site sensitivity in a whole and accordance, includes topography, hydrographic and potency of environment in site. Basic ability of land development and basic knowledge of architectural design related to site, which is appropriate to character function and its site. Complete site survey equipment which can be accessed by student. 10 Analysis and Programming Ability to collect various information and precedents related to architectural design problem and to write a program based on the result of the analysis. 11 Historical and Cultural Context of a Site Ability to extract a design concept based on the understanding of the various historical and cultural context of a site; analyze and evaluate them systemically; and apply them concretely in their project. 12 Site Preparation Ability to formulate a design concept based on the understanding of the cultural and historical context of a site, systematically analyze and assess the acquired data and information acquired, and implement the findings into the design resolution. 13 Barrier Free Design Ability of design a building to meet the various requirements of diverse building users including elderly, the infirm, and handicapped/disability. 22 Environment Control System Understanding of the basic principles of the environment system and the assessment method of thermal, light, sound, environment and energy management. 28 Project Carry out and Role of Architects Understanding of the role of architects, such as leadership, collaboration and coordination that are required in all the stages of design process. Sustainable Architecture 4 2 Sustainable Architecture Course involves sustainability of architecture design including ecological, social, and technical values. This course equips the students with science and architecture based on sustainable environment. It aims to provide the students with understanding of ecological values, social acceptance in accordance with economic/technical feasibility during designing process. Those can be used to support various elements in one ecosystem. This course supports Design Architecture Course 4-7. 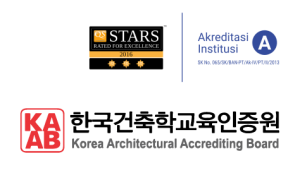 It is also relevant with SPC KAAB number 8 (Sustainable City and Architecture), 16 (Design of Addition/Alternation, Repair, and Maintenance), 21 (Sustainable Means of Environment Control), and 25 (Building Materials and Recycling). 8 Sustainable City and Architecture Understanding of the sustainability of city and architecture. 16 Design of Addition/Alternation, Repair, and Maintenance Ability to assess and make changes or maintain the form or functions of existing buildings to renovate, rebuild, remodel and/or repair. Students are able to understand Sustainable Construction in renovation, rebuild, remodel and/or repair. 21 Sustainable Means of Environment Control Understanding of sustainable means of environment control and cyclic process of nature. Students are able to understand environmental issues related to global warming, tropical climate characters and local wisdom principles. 25 Building Materials and Recycling Understanding of the manufacturing process and application of building materials based on the basic knowledge on characteristics of materials, building components, traditional way of usage, material standards; as well as recyclability, maleficence, and other control measure of building materials. Students are able to understand waste management and domestic waste, materials and hazardous waste (B3), and material and waste recycle process. Housing Studies 3 2 Housing Studies is a 2 credits compulsory course which aims to equip students with basic knowledge to understand basic principles of housing construction. Learning materials are related to three main variables, i.e. 1) problem identification and urban development phenomenon, and their effects to the housing development (SPC 17); 2) human behaviors such as crowd, adaptation, and territories consideration (SPC 07); and policy/housing programs which have been applied (SPC 06). This learning process is conducted by applying 3 techniques, i.e. lecture, group discussion, and exercise. The final score represents learning outcome taken from the recapitulation of the attendance, learning exercise, mid semester test, and final exam score. 17 Design of Architecture and City Understanding of the basic principles of housing design, urban design, and urban planning. Ability to critically assess city and urban planning and utilize the outcomes in the design process. Human behaviors: crowd, adaptation, and territories consideration. Variety of Housing program policy: old order, new order, and reform era. Thermal Environmental Control 2 2 Learning objectives of this course is to give students an understanding of the basic principles, evaluation, and recommendations as design guidance to controlling thermal environment of the building. Urgency of this course is to provide a basic understanding of how to achieve thermal performance of architectural space that suit to space thermal qualities desired through the understanding of the basic principles, evaluation to the thermal environment control of room. This understanding is very important in terms of the achievement of Learning Outcomes program in Building Science and Technology Laboratory. This competency will support throughout the entire Design Studio Course and final project, particularly for Design Studio 3. 22 Environment Control Systems Understanding of the basic principles and assessment methods of environmental control systems including thermal, lighting, acoustical systems, and energy management. Students can understand the basic principles and can evaluate air and thermal quality. Students can understand the principles of passive environmental thermal control. Students can understand roles and relationship between science and technology related to the room thermal quality with architecture. 7 Human behavior Understanding of theories and methodologies that identify the relationship between physical environment and human behaviour. Students can understand the role and relationship between room thermal quality with human behaviour. Architectural Design Studio 2 2 4 This course is given in 2nd semesters with 2 credits. Learning objectives of this course is to develop student’s ability in small scale architecture designing as spatial and tectonic composition to accommodate simple function and usage in generic real site context. This ability is a development of architectonic aesthetic composition principles given in Architectural Design Studio 1. This ability will be developed for more complex function and site in Architectural Design Studio 3. This course, also, have target to create graduates that have capability to respond social and environmental issues by doing intervention to site in marginal environment. 1 Oral and Literal Communication Ability to communicate architectural ideas in writing and speech, and the ability to communicate in a foreign language. 3) technical drawing compilation; 4) 3D model 5) Oral Presentation which are used as exercise for students to enrich and strengthen their basic skill of architectural design drawing. 3 Architecture, Science, Technology and Fine Art Understanding of the relationship among architecture, science, technology and fine art. Students are able to understand the relationship between architecture and technology through the application of the basic tectonic composition using simple materials. 9 Form and Spatial Organization Understanding of the basic principles of 2D and 3D forms and design, architectural composition and ability to apply these principles to design a building. Students are able to understand the principles of basic shape, 2D and 3D architecture composition design, and also explore simple anthropometric and applicate it to building architecture tectonic. 27 Ethics of Architects and Professional Obligation Understanding of the ethics, responsibility and professional obligations to client and society. 7 Human Behaviour Understanding of theories and methodologies that identify the relationship between physical environment and human behavior. Students are able to understand theory of relationship between human behavior and lighting. Students are able to understand the sustainability aspect of lighting control. Students are able to understand the basic principles of environment system related to lighting. Students are able to evaluate and propose generic recommendation. Building Information Modelling 3 4 This course aims to make students able to present a three-dimensional model presentation as well as prepare a document image with more structured information. Learning process is in the form of discussion and problem solving practice or case study in a simple building. This subject becomes one of supporting subjects for competence of graduate study program which is based on Architectural Studies Program curriculum that is included in 24% of scientific and skill course and held in the digital architecture practice room with a small class of maximum25 students. After participating in this course, students are expected to be able to present better and structured architectural ideas through the media of computing, especially Building Information Modeling to then be applied in group of integrated design course in the ongoing and next semester. 2 Various means of expression Ability to express architectural ideas appropriately by means of various media such as sketch, model, drawing, writing, and digital drawing. 24 Application of Computer Technology Understanding of the utilization and application of computer technology in the design process including, for instance, a Building Information Modelling system. Able to use computer in Building Information Modeling-basis for two storey building and present it in a more structured information. Integrated Building Engineering 5 4 Integrated Building Engineering will emphasizes on the activity of design utility system on midle-level building which is integrated with structure system and other building element by learning building utility theories, standard of utility and building safety as well as studying about several building that has been built. This is aimed for students to not only understand and comprehend the integration, but also able to apply it directly to a design building. The learning process is designed to give experience for students about building utility theories, standard of utility and safety building as well as its application in design of building. This course is in line with department’s vision and missions related to graduates who comprehend the process of technical design and structure integration and infrastructure become a united function that effective and aware towards user’s safety and preservation of targeted environment. 23 Building Service Systems Understanding of basic principles and selection of appropriate building service. 15 Integration of Building System in Design Understanding of a building system and its constituent elements such as building structure, building envelope, composition of building, mechanical and electrical service and other building components, and the ability to integrate them into his/her design. 25 Building Materials and Recycling Understanding of the manufacturing process and application of building material based on the basic knowledge on characteristics of materials, building components, traditional way of usage, material standards : as well as recyclability, maleficence, and other control measure to building material. Students are able to comprehend the characteristic of material and its application to the related building with utility system and building safety. Building Structure System 1 3 4 This course is aimed to give understanding about basic concepts of building structure which influences shape development and architectural space, so that the graduates are able to choose and apply it in architecture design. This course also gives knowledge as a whole about building structure system, background of structure principle, as well as able to choose the use of architectural concept and present it in planning and design document. 20 Structural System Understanding of various systems of building structure system and their application in design. 19 Principles of Building Structural Engineering Understanding of the basic theories and principles of forces and building structure. Comprehend the basic principles of various kind of building structure system. 15 Integration of Building Systems in Design Understanding of a building system and its constituent elements such as building structure, building envelop, composition of building mechanical and electrical service and other building components, and the ability to integrate them into his/her design. Comprehend the part and relation of sub-structure building elements, main structure, building envelope, non-structural elements. materials based on the basic knowledge on characteristics of materials, building components, traditional way of usage, material standards; as well as recyclability, maleficence, and other control measure of building materials. Comprehend the material of building as well as its application in building elements. 02 Various means of expression Ability to express architectural ideas appropriately by means of various media such as sketch, model, drawing, writing, and digital drawing. Comprehend the main work image in architecture design. Architectural Design Studio 3 3 6 Architectural Design Studio 3 is a continuation of Architectural Design 2 with 6 credits. It offers building case with residential function in natural site with specific character. Problem that needs to be overcomed is the achievement of residential activity needs and utilization of site potential – the natural environment. Thus there needs to be a study of character of subject, character of activities that will be accommodated and potential natural environment site which is utilized as basic consideration of future planning; spatial form and its order with air duct consideration, natural exposure, anthropometry, comfort of motion and structure of the election (the top, middle and bottom) and basic infrastructure. Students are able to design a group of small-scale building, consist of 1-2 floors with standard pattern activity and various users. 3) technical drawing compilation; 4) 3D model 5) Oral Presentation which are used as exercise for students to enrich and strengthen their skill of architectural design drawing. Students are able to design a layout of building and tentative solution for spatial component and building that embodies a simple activity with activity pattern and various users which are diverse in the context of natural element that stands out and contoured. Students are able to design organization of spatial building which accommodates the simple pattern of activity and diverse users. Students are able to design a geometric composition with organizing the shape and space consistently and creatively based on concepts or design assumption that have been identified previously. Students are able to engineered site and building as well as its component for conciliating site constraint and potential naturally (climate, light, vegetation, topographic, including contours and components of landscape with specific character (seaside or mountainous areas) with demands of internal (program space and organization of space) precisely. 22 Environment Control Systems Understanding of the basic principles of the environment system and the assessment method of thermal, light, sound, environment and energy management. Students are able to assess the proper design based on the performances, thermal, light and specific green design criteria. Civic Education 7 2 Course of State Philosophy is included in the group of personality development courses. This course has 2 credits. – Historicity; as a nation that respects the history of the nation, the life of the nation is never separated from the values that have been instilled by the founding fathers. – Cultural; as a nation that has cultural roots and values, then we must have a solid foundation so that the cultural identity of the nation will not extinct throughout the eras. – Juridical; in the college statutes, written the need of preservation for the values of state philosophy. Urgency of this course is that students are able to explain and reflect the ideological-philosophical basis in their respective fields of study. 7 Human behavior Understanding of theories and methodologies that identify the relationship between physical environment and human behavior. The students can understand the principles of good and responsible citizenship, based on the values of state philosophy. 4 World History of Architecture and Tradition Understanding of architectural history of the world and the diversity of tradition. 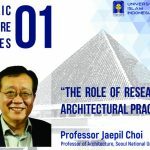 Understanding of the unique philosophy of Indonesian architecture and cultural tradition. 5 History of Indonesian Architecture and Tradition Understanding of the unique philosophy of Indonesian architecture and cultural tradition. 6 Architecture and Society Understanding of the relationship and mutual influence of history, society, region, and policy. Architecture Design Studio 4 4 6 This course is given in 4th semesters with 6 credits and were included in the coursesgroup of Expertise in Work. In the constellation of the curriculum 2013, this course sequence with Architectural Design Studio 3as its pre-requisite, and as a pre-requisite for Architectural Design Studio 5 with a passing score of at least C.Urgency Architectural Design Studio 4 is the emphasis of contextual design of the built environment to the urban site location as a translation of the vision and mission of department of architecture in excellence character based on Indonesia’s urban context, commitment to the built environment that responds to the social patterns of urban, and design-based professional. After passing this course, students are able to design a simple mix-use building on the site covering an area of 900 to 1500m2, medium-sized buildings, consisting of 3-4 floors which accommodate the spatial complexity of public buildings that respond to the social needs of local communities with large numbers of users. The result of this course is to design a building with a geometric composition that responds to the pattern of the structure in an urban area, its structure and infrastructure system, with control of the artificial environment. Ability to formulate a design concept based on on the understanding of the cultural and historical context of a site, systematically analyze and assess the acquired data and information acquired, and implement the findings into the deign resolution. Ability of design a building to meet the various requirement of diverse building users including elderly, the infirm, and handicapped/ dissability. Islamic Civilization and Thought 4 2 Learning objectives of this course is to give students an understanding of basic thought principles in development of islamic civilization. Based on Sanaky, 2006, “Islamic civilization is part of the islamic culture, which includes aspects of life such as moral, art, science, and also technology system, building art, fine art, state system, general knowledge” . Urgency of this course is to give basic understanding of the development of Islamic thought, including thought evolution in society activity, from simple basic needs to ideas of complex function, then evolved on the relationships of traditional values that exist in various areas when Islam spread to a wide area, to the thought related to ideas of symbolic aesthetic needs. From here, its clear that islamic thought and civilization have strong relationship with science of architecture. 4 World History of Architecture and Tradition Understanding of architectural history of the world and the diversity of tradition. Students are able to understand relationship and thoughts that influence each other between Islamic civilization area. Understanding the relationship between activity container with the thought and behavior of Islamic societies. 10 Analysis and Program Writing Ability to collect various information and precedents related to architectural design problem and to write a program based on the result of the analysis. Professional Practice 5 4 The aim of this course is for student able to comprehend professional Architect ethic (Ethic profession, IAI), understand and comprehend on how the relationship between architect and user (standard IAI). Student comprehends the type of design delivery options, design phase, standard of architect works (AIA, IAI,PU/Kimprasiwil), project operations, working organization structure and project teams, construction document, drafting job offering of bidding and negotiation, labor contract documents and guideline of standard fee, attempt to seeking the Project, legal aspects which are associated since from: project bidding, the initial process of design to post-design. 28 Project Carry out and role of Architects Understanding of the role of architects, such as leadership, collaboration and coordination that required an all stage of design process. 29 Building Code and Regulation Understanding of construction laws and regulations related to public safety and welfare, property rights, building codes and regulation, design, construction and practice, and the legal responsibility and liability of architects. Building Performance Evaluation 6 2 The urgency of the course is to equip students with complete understanding of building evaluation aspects which are related to conservation and preservation. After accomplishing the course, the students will understand evaluation principles of the building process from planning, designing, constructing, supervising, and building utilizing of either recent or old building process. It also discusses the building evaluation related to potential disaster areas especially earthquake. The essence of the course is in accordance with SPC KAAB number 16 and 28. 28 Project Carry out and Role of Architects Understanding of the role of architects, such as leadership, collaboration and coordination that are required in all the stages of design process. Understanding preservation and conservation principles of existing building and environment. 3) technical drawing compilation; 4) 3D model5) Oral Presentation which are used as exercise for students to enrich and strengthen their skill of architectural design drawing. 20 Structural System Understanding of various systems of building structure system and their application in design. This course is relevant with science competency and building technology with environmental sustainability basis. With this course, it is expected that the students comprehend the principles of network system infrastructure, principles of security and safety, and universal transportation in low-rise building as needed. 13 Barrier Free Design Ability of design a building to meet the various requirement of diverse building users including elderly, the infirm, and handicapped/disability. Students are able to comprehend horizontal, vertical, and diagonal universal transportation in low-rise building. 14 Safety, Fire Protection and Emergency Egress Ability to design a safe building based on the basic principles of building safety, fire protection and security and in consideration of safety of human life, evacuation, and/or emergency egress. Students are able to comprehend security and safety principles in low-rise building as needed. service systems such as mechanical, electrical, communication, and disaster protection system. Students are able to comprehend the principles of network infrastructure system in low-rise building as needed. State Philosophy 2 2 Course of State Philosophy is included in the group of personality development courses. This course has 2 credits. Learning objectives of this course is to give students understanding of: Historicity; as a nation that respects the history of the nation, the life of the nation is never separated from the values that have been instilled by the founding fathers. Cultural; as a nation that has cultural roots and values, then we must have a solid foundation so that the cultural identity of the nation will not extinct throughout the eras; Juridical; in the college statutes, written the need of preservation for the values of state philosophy. 8 Sustainable City and Architecture Understanding of the sustainability of city and architecture. 17 Design of Architecture and City Understanding of the basic principles of the housing design, urban planning, and urban design; and ability to critically assess city and urban planning and to utilize the outcomes in the design process. 29 Building Code and Regulation Understanding of construction laws and regulations related to public safety and welfare, property rights, building codes and regulations, design, construction and practice, and the legal responsibility and liability of architects. Academic Writing 6 4 Academic Writing is a 4 credits compulsory course and offered in 6th semester. It contributes towards Student Final Projects, Proyek Akhir Sarjana (PAS) , and becomes pre requisite for student final project course in fast track program. 2 Various means of expression Ability to express architectural ideas appropriately by means of various media such as sketch, model, drawing, writing, and digital drawing. 18 Integrated Design Ability to assess the various elements and components that constitute a building necessary in all the design stages; to integrate them into a design of a building; and to produce a design document with a critical explanation. 24 Application of Computer Technology Understanding of the utilization and application of computer technology in the design process including, for instance, a building information modeling system. 10 Analysis and Programing Ability to collect various information and precedents related to architectural design problem and to write a program based on the result of the analysis. 16 Design of Addition/ Alternation, Repair, and Maintenance Ability to assess and make changes or maintain the form or functions of existing buildings to renovate, rebuild, remodel and/or repair. 1.The study on the context between architecture and the other branch of science such as science, technology and fine art (SPC 3). 2.The study on basic principles of composition and form in the context of experimental architecture design (SPC 9). The understanding of the mentioned aspects shall be used as the basic theoretical framework of other courses especially to open the students’ insight of experimental ideas required on their papers and final project. 3 Architecture, Science, Technology, and Fine Art Understanding of the relationship among architecture, science, technology, and fine art. Students understand the context between architecture and non-architectural aspect in terms of experimental architectural design. 9 Form amd Spatial Organization Understanding of the basic principles of 2D and 3D forms and design, architectural composition and ability to apply these principles to design a building. Students understand the basic principles of two-dimensional arrays and three – dimensional arrays including design composition in terms of experimental architecture. Contemporary Islamic Architecture 7 2 Contemporary Islamic Architecture is on the 6th semester with pre-requisite course: Islamic Thought and Civilization which gives students picture of the dinamics of Islamic Civilization in the world. This course is aimed to develop students’ knowledge in comprehending issues related to Islamic architecture today and its relation with cultural heritage and Islamic Architecture tradition from pre-modern which covers social, cultural, normative, historical, symbolic, and aesthetic aspect. 4 World History of Architecture and Tradition Understanding of architectural history of the world and the diversity of tradition. 9 Analysis and Programming Ability to collect various information and precedents related to architectural design problem and to write a program based on the result of the analysis. Heritage Conservation 6 4 Heritage Conservation course supports institutional vision and mission in developing sensitivity towards socio-culture, especially in Islamic world. 11 Historical and Cultural Context of a Site Ability to extract a design concept based on the understanding of the various historical and cultural context of a site; analyze and evaluate them systemically; and apply them concretely in their project. 2 Various means of expression Ability to express architectural ideas appropriately by means of various media as sketch, model, drawing, writing, and digital drawing. Informal Urbanism 7 2 The learning objective of this course is to give understanding to the students of how to find solution and give recommendation of concept for Infomal Urbanism problems. Architectural Excursion 7 4 This course is intended to support the main competency that is the ability to comprehend world history and tradition and analyze the influence of the history, society, region, and architecture design regulation with the intention that students are able to appreciate the context well. media such as sketch, model, drawing, writing, and digital drawing. 26 Construction Procedure and Construction Management Understanding of construction procedure and construction management to effectively facilitate physical, human, and technical resources within a local context. 30 Operation and Management of Architectural Practice Understanding of the basic facts and management skills required in the operation of an architecture practice office. 13 Barrier Free Design Ability of design a building to meet the various requirement of diverse building users including elderly, the infirm, and handicapped/disability. 7 Human behavior Understanding of theories and methodologies that identify the relationship between physical environment and human behavior. Students Community Service 8 2 Student Community Service (KKN) is a course which aims to make the students comprehend how to conduct observation (observation, accurate survey) towards selected location, coordinate with society, become partner to create collaboration with society/institution/organization, propose activities, execute activity, and compose activities report. Studio Profesional 1 9 8 Professional Studio 1 Course is a supervised studio type of course that gives students working experience in off campus studio with real project that is supervised by adjunct professor as senior architect and senior lecturer as main supervisor. safety and welfare, property rights, building codes and regulations, design, construction and practice, and the legal responsibility and liability of architects. operation of an architecture practice office. Advanced Architectural Theory 10 8 This semi studio course is designed as an applied research, in which the students apply various design competences they got in a real project, in their capacities as the architect’s assistant. After that, the students are required to arrange a report of the result of critical reflection towards professional working experience with an architect. To realize the university lecture demand above, this course is designed as a semi studio, which consists of 3 (three) modules, they are (1) Architectural Critics, (2) Report Writing and Presenting. Architectural Critics discusses how architectural creation is appreciated and valued its quality. Furthermore, Architectural Critics also discusses how the practices of architectural design are reflected into a theory. 26 Construction procedures and construction management Understanding of construction procedure and construction management to effectively facilitate physical, human, and technical resources within a local context. 28 Project carried out and roles of architects Understanding of the role of architects, such as leadership, collaboration and coordination that are required in all the stages of design process. 29 Building codes and regulations Understanding of construction laws and regulations related to public safety and welfare, property rights, building codes and regulations, design, construction and practice, and the legal responsibility and liability of architects. 30 Operation and management of architectural practices Understanding of the basic facts and management skills required in the operation of an architecture practice office. Project Development Mangement 9 4 Based on curriculum, this course is given in ninth semester and weigh 4 (four) credit. The purpose Project Development Management course is designed to provide understanding and comprehension of the activities to provide students work experience in planning studio in the atmosphere of developer company. The undertaken project is a concrete project with moderate complexity of design problem and low risk level of development. a. Students are involved in supervising and controlling the composition of design concept and designing as a response to terms of reference. c. Students are involved in supervising and controling the project execution.